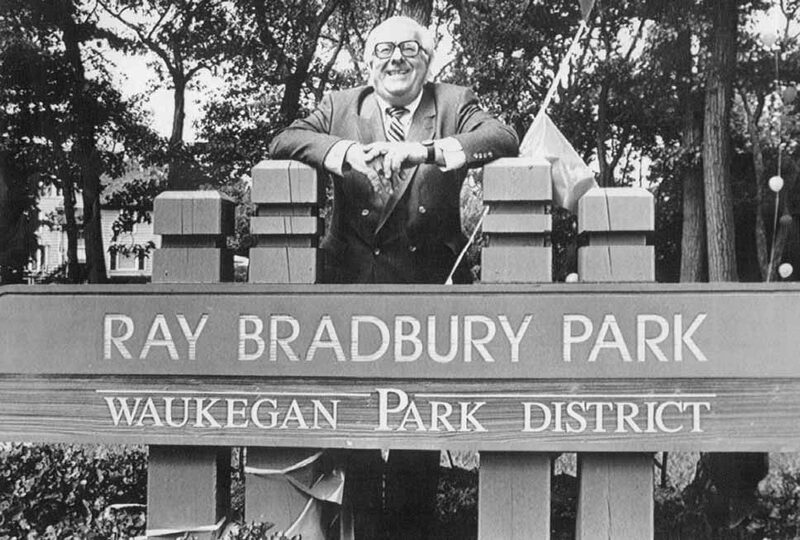 Waukegan native Ray Bradbury was nothing short of a science fiction icon. His international reputation was solidified with the groundbreaking 1950 publication of The Martian Chronicles, telling the story of Earthlings trying to conquer Mars. From there, novels such as Fahrenheit 451 and Dandelion Wine defined a new American genre and changed the way we see the world. In 2020, a new 3,500-square-foot interactive facility that explores the major themes of the late author’s life and work will honor that legacy and invite a new generation to discover what is being called the Ray Bradbury Experience Museum (RBEM). It will be appropriately located in Bradbury’s hometown of Waukegan (affectionately referred to as “Green Town” in his novels) but supporters of RBEM are spread throughout the North Shore. Sandra Petroshius of Lake Forest currently leads the board of directors for the new museum and was one of the pioneers of the idea. Soon after Bradbury’s death in 2012, Petroshius began working with The Greater Waukegan Development Coalition to find a way to pay tribute to one of the city’s most famous native sons. Specific exhibit designs are still being developed but “the goal is to engage visitors in Bradbury’s imagination,” explains Petroshius, who personally recalls seeing him in the Waukegan Library, “whitehaired, but tirelessly signing books for hours until everyone who sought one had one.” Multimedia exhibits will include virtual and augmented reality with themes of space travel, magic and freedom. There will also be exhibits dedicated to The Martian Chronicles, Dandelion Wine, Fahrenheit 451, and Something Wicked This Way Comes, along with a biographical exhibit and an “Inspired By” section—an impressive undertaking that will feature famous artists, directors and authors whose work or lives were touched by Bradbury. Petroshius and another board member from Lake Forest, Terry Fertig, are currently working with Bradbury scholars and academic experts from all over the country to make this vision a reality. Bradbury’s work—which spans science fiction, mystery, and horror—was justifiably awarded during his lifetime, with accolades that included a Hollywood Walk of Fame star, a Pulitzer Prize citation, and a National Medal of Arts. He was consulted by Walt Disney World to create the storyline and script for Spaceship Earth, a futuristic attraction at Epcot Center. Bradbury is even memorialized in space—the landing site of the Mars Curiosity Rover is named Bradbury Landing, and an impact crater on Earth’s moon was named Dandelion Crater by the Apollo 15 astronauts, in honor of Bradbury’s Dandelion Wine. Building a museum from the ground up is no easy feat, but Petroshius and her team are consistently motivated by the man they are working to memorialize. “Ray Bradbury was a positive, loving human being with a boundless imagination,” she says. “He saw through to the heart of issues and fully embraced life.” The RBEM team is also encouraged by the author’s four daughters, who have given the museum their enthusiastic endorsement. Given Bradbury’s own love of comic books, Petroshius says the July Comic-Con event was the perfect venue to reveal plans for the museum to the public. RBEM had a booth with images of its proposed exhibit in honor of The Martian Chronicles and provided samples of augmented reality experiences. The Ray Bradbury Experience Museum plans to open its doors at 13 N. Genesee Street in Waukegan in August 2020, timed to coordinate with Bradbury’s August 22, 1920 birth. Petroshius says it will be a centennial celebration for the ages. For more information, visit raybradburyexperiencemuseum.org. Author Ray Bradbury would have turned 100 in 2020 — the year his hometown, Waukegan, plans to open a museum to honor his legacy.